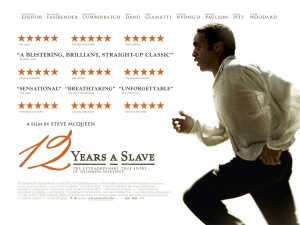 Put bluntly, 12 Years A Slave may be the most brutal film you’ll see in a good long while. It’s certainly excellent, and a cinematic marvel that needs to be seen by as many people as possible, but extremely brutal at the same time. It is the triumph of director Steve McQueen that such a dark piece of American history is not sugar-coated for audiences. We get to see full-on the truly horrendous acts of anyone associated with slavery, from severe torture to sexual abuse, and nothing is romanticised nor downplayed in this film’s shaming of those responsible. We, of course, will never see for ourselves the real horrors of the pre-Civil War Antebellum South play out in front of our eyes, but 12 Years A Slave stands as perhaps the closest we may ever come to experiencing it in its entirety – or at least, through the language of film. But McQueen handles his difficult subject matter with great care, creating a film that deserves to be added to a long line of essential historical dramas such as Schindler’s List and Lawrence of Arabia in the process. His past work on Hunger and Shame has given him enough stability and competence to tell a cohesive – occasionally non-linear – story on-screen and here, it’s perfected to the highest standard. In addition, his previous identity as an artist enables him to have a vision of what makes the cinematic world he is portraying so enthralling, vibrant and say exactly what it wants to say, uncensored. Steve McQueen was the right and only person to tell the true story of Solomon Northup on the big screen without succumbing to the Hollywood guidelines; any other director taking on this material could have very easily made this a slice of manipulative melodrama, and thus the story it was trying to tell wouldn’t have been so powerful as it really is. Credit is also due in favour of writer John Ridley, who adapts Northup’s novella of the same name with an intelligent approach that gives them the harsh facts of the time without softening the blow. The frequent use of the dreaded “n-word” is here entirely justified and within historical context, not used for shock factor but keeping in line with how people really spoke back then. Today, of course, we would all feel uneasy whenever anyone says it so it is beyond uncomfortable to see a film where most if not all white characters use the derogative term in everyday conversation. The writer accomplishes what others may have tried to do but failed, in that such a word may be frowned upon nowadays but in the 1800s was considered close to the word of the day which reflects our devolved state of mind in those times. In short, Ridley writes a script fitting of the times it is set in and the people who inhabit it. Chiwetel Ejiofor, as Solomon Northup – or “Platt” as he is called for the majority of the film by his white owners – is absolutely astounding in a role that finally fits his unchartered acting abilities. He brings great presence and inner-strength to someone who goes through the very worst of lives during the time period but comes out of it all emotionally wrecked but defiant and headstrong. As we see in the opening few scenes – probably the only times when we see him truly smile – he is a loving father and husband, a successful fiddle player and a respectable member of the community; an all-round likable guy. Which is why it is beyond heart-breaking to see him go through extreme violence – various whipping incidents, and one particularly brutal beating of his back with a paddle after his initial kidnapping and capture – and psychologically damaging events, such as being forced at gunpoint to perform a severe whipping to a fellow slave. And yet, as he so states, he strives to not become the emotional wreck so many other slaves seem to have become, and to instead keep his self “hearty, till freedom is opportune.” Solomon inhabits an extraordinary amount of human spirit despite experiencing some of the most heinous acts against his race, and Ejiofor conveys each and every aspect of it with grace and power. It is a performance all in its own category, and deserves to be singled out as one of the best in a good long while. The film is also filled to the brim with established character actors in fairly small parts, from Benedict Cumberbatch’s kindly if misguided plantation owner to Paul Giamatti’s cruel and heartless slave trader whose compassion “stretches the length of a coin”. In a more significant role, Michael Fassbender as mentally unstable slave owner Edwin Epps is a terrifying on-screen villain and excellently portrayed, though he may be overshadowed by Lupita Nyong’o as slave Patsey who catches Epps’ eye in more ways than one. The relative newcomer is given a character so drenched in tragedy and despair that it’s miraculous she doesn’t start singing “I Dreamed A Dream” at any point, but Nyong’o gives her an edge that makes you weep anytime she appears to be the victim of abuse. One of her first scenes is of her constructing dolls out of sticks and other natural sources, almost childlike, followed soon after by her getting a brandy carafe thrown at her face. It’s incredibly disheartening to watch, and as with Ejiofor she gives the right amount of emotion to give herself a fantastic on-screen presence. In all honesty, there are no major faults that can be found within 12 Years A Slave; the only bad things one can say about it are mere nit-picks at best – for example, it never gives us the sense that twelve years really have passed, and aside from subtle changes here and there (grey bits in Northup’s hair) it does not establish a certain length of time as opposed to a continuous set of events. It is a new cinema classic that should be reserved for each and every history lesson on the subject of slavery, and one that should over time line itself up as one of the strongest period dramas of the last few decades. In various interviews, McQueen has likened Solomon Northup’s story to Anne Frank’s in terms of importance. You know, he’s on to something there. 12 Years A Slave is an outstanding piece of modern cinema, from fantastic acting (particularly by Chiwetel Ejiofor, Michael Fassbender and Lupita Nyong’o) to direction and writing of the highest calibre, and feels like the first film in years that could very well be in line with some of the greats. Powerful in every way imaginable, it’s absolutely unmissable.